A fruity mango marshmallow with a passion fruit zing. Made with real mangos and passion fruits. Great Taste 2015 winner of two gold stars. If you're feeling fruity, you must try these! 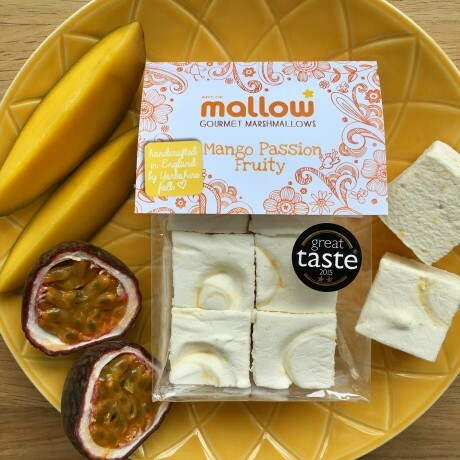 Each 75g bag contains six generous cubes of handmade marshmallow. Gluten free. Dairy Free. Naturally low in fat. Made in a kitchen where nuts are stored. sugar, water, glucose, beef gelatine, mango puree (3%), freeze dried passion fruit (1%), salt, corn starch.